As cities take on greater importance — as population centres and economic hubs — they have also become front lines in most of today’s conflicts. Located in south-western Yemen, only an hour’s drive from the Red Sea, the ancient city of Taiz was once known as the country’s industrial base, a centre for the production of coffee and Yemen’s cultural capital. 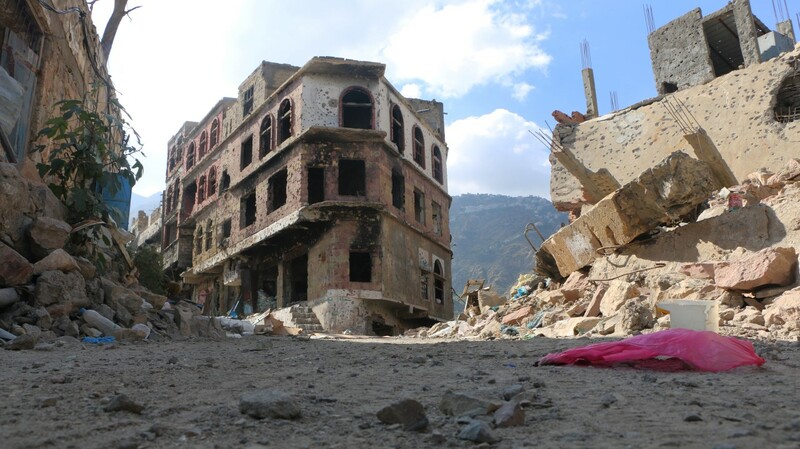 Today, much of Taiz is in ruins, with many of the city’s trademark brown-and-white bricked buildings reduced to rubble. Streets are littered with burned out cars and debris. Its famous governor’s palace — a castle built on a conical mountain — is now just piles of dirt. The city’s inhabitants — more than half a million people — have suffered deeply, enduring shelling, sniper fire, street-to-street combat and aerial bombardment. A relative stalemate between opposing forces means the front lines have not moved significantly in many months, placing the population in the midst of a protracted, bitter standoff. City streets, once vibrant with traffic, cars and market stalls, are places of fear, of life and of death. “We were deeply happy until the war broke out in the city,” says Hanan Addahbali, a widowed mother with a newborn baby girl. Now, people with no involvement in the fighting have been surrounded by destruction, blood, fear and loneliness. “I would hug my baby girl when there were clashes and shelling [and] take her to the other room where sounds of bullets and shells were less [loud],” adds Addahbali. “On one of those difficult days, my husband went out to buy some stuff for the house. While he was on his way back home, he was shot and killed by one of the snipers on the rooftop of a nearby building. My husband was not a fighter. He did not even know how to carry a weapon. The pain this woman has endured, along with the saga of Taiz itself, are examples of an increasingly common phenomenon in the world today: protracted and highly destructive urban conflict. The Syrian city of Aleppo is the most well-known recent example. But it is far from alone. There is now a long list of cities that have suffered — or continue to suffer — from the devastating impacts of urban warfare. Here are a few: in Syria, there are Homs, Daraya, Deir Ezzor and Idlib; in Yemen, there are Aden, Taiz, Sa’ada and Sana’a; in Iraq, there are Fallujah, Mosul, Ramadi and Baghdad, among others. A new report by the ICRC, I saw my city die (expected to be released in May), details the human toll of urban warfare (including the story of Hanan Addahbali above). It also explains some of the causes and makes a forceful set of recommendations to reduce the impact on civilians and the cities that support them. The report focuses on the Middle East, in particular Iraq, Syria and Yemen, where conflicts have been almost entirely defined by fighting over urban territories. Why are all these conflicts playing out in an urban environment? According to experts interviewed for the report, fighters sometimes use the urban landscape for tactical purposes, to hide from opposing forces or to draw them into a situation of relative vulnerability. While insurgents in past decades have tended to hide themselves in mountainous areas or under the cover of jungles, the wide-open topography of the Middle East makes cities a logical place to base their operations according to some observers. Warring parties, on the other hand, often say they must fight in urban areas to defend the local population or their own territory. Cities also have symbolic and strategic value and warring parties vie for control of populations, industrial and economic resources and propaganda points. Whatever the reasons, fighting in the urban environment has catastrophic consequences. In just one 72-hour period in November 2016, for example, the main hospitals in Taiz reported receiving an average of 200 wounded patients per day many of whom suffered from blast injuries. Many had to have limbs amputated. Another tragic fact is that this kind of overwhelming demand for urgent medical care often comes just as public health systems in conflict-ridden cities have all but collapsed. In Taiz today, no public health centres remain open, according to the ICRC’s Taiz subdelegation, while the city’s only two hospitals — one government-run, the other private — function with minimal resources and dwindling staff. Health workers in these hospitals endure long hours, frequent power outages and shelling due to their proximity to the front lines. Given that the hospitals must prioritize people with life-threatening injuries, there is little time or resources left to deal with public health concerns, such as maternal and infant health, routine vaccination or monitoring of infectious diseases. Field hospitals run by armed groups similarly focus mainly on war wounded. 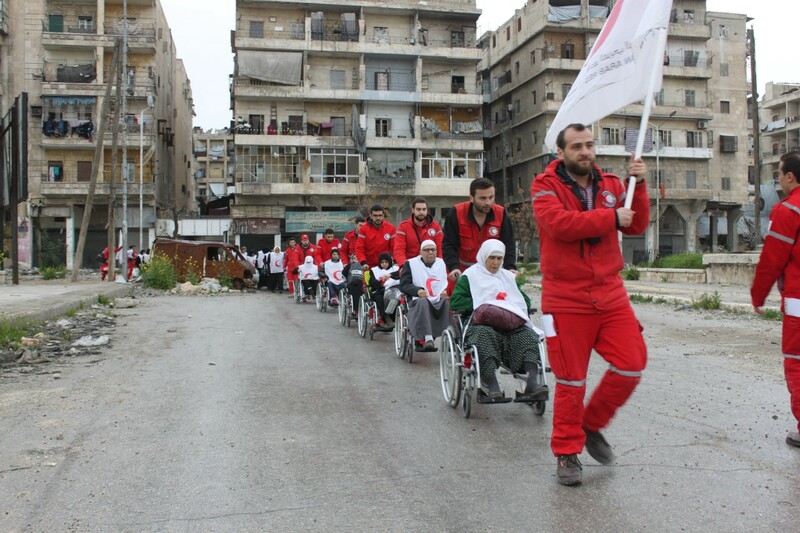 Meanwhile, standard ambulance services are virtually non-existent and warfare frequently interferes with the ability of medical and humanitarian workers to reach people injured in the fighting. In addition, any emergency field mission requires multiple negotiations by telephone and at checkpoints controlled by various armed groups operating in the city. Today’s powerful explosive weaponry can cause not only numerous casualties but can displace large numbers of people very quickly. When warring parties deliberately or systematically target civilians, the bloodshed and displacement are often much greater. In densely packed urban neighbourhoods, the numbers of displaced people can rapidly overwhelm the ability of nearby cities, or even countries, to absorb and adequately host the displaced population. For those trapped by the fighting, the situation can be even worse. While the cities are often economic engines that power regional economies in normal times, they are also largely dependent on external resources in order to meet basic needs such as food, water and heat. Conflict in towns and cities today has also been characterized by increasing instances of an ancient form of urban warfare: the siege. The eastern portion of Aleppo, for example, was subject to a siege that lasted 190 days and other blockages of humanitarian assistance in the city caused massive suffering for the civilian population. But many lesser-known Syrian cities and towns — Deir Ezzor, Daraya, Foua, Kefraya and Madaya — also came under siege of rebel or government forces at various times during the conflict. Throughout these sieges, people suffer tremendously but also show incredible resilience. With no functioning power supply, people often rely on lights powered by lead batteries, which they recharged by generator every two or three days. Living and going to school in basements for their own safety, many young children in some cities have suffered from vision impairment due to spending so much time in the dark. With no petrol to be found, priority buildings such as schools and hospitals are kept up and running with talqa, a fuel made through a makeshift process of boiling and refining small pieces of plastic. The Yemeni city of Taiz is not under siege, but the extreme difficulty of getting goods in and out of the city has created siege-like conditions, including the collapse of the local economy. “Most markets in the city have closed and in the few markets that still have some food, the prices are so high that people cannot afford to buy anything,” says Nancy Hamad, head of the ICRC’s subdelegation in Taiz. “Malnutrition cases have increased drastically, especially among children. Easing the hunger pains of populations under siege, or suffering under siege-like conditions, poses tremendous challenges for humanitarian organizations, which continue to make urgent appeals in order to gain access to besieged cities and deliver desperately needed food and medical supplies. They have also had to be creative. With humanitarian food aid blocked from Taiz, the ICRC began supporting 29 local bakeries in August 2016 to provide bread directly to the most needy families. Residents who participate receive up to 18 free loaves of bread from certain bakeries, which are then reimbursed by the ICRC. While this is far from meeting the full nutritional needs of Taiz’s population, it is making an impact. Today, the programme reaches roughly 13,000 households (35,000 people) and the next phase is expected to extend to 25,000 households. People who live in cities are also heavily dependent on complex networks of services that are deeply entwined. Water delivery is dependent on reliable electricity, which may rely on oil production and petrol delivery. If any part of the complex systems that supply water or electricity, or that process waste, are damaged, destroyed or intentionally targeted, many thousands, or even millions, of people could be at risk of infection from otherwise preventable deadly diseases. Humanitarians, therefore, must work with a wide range of service providers to help cities cope. In Aleppo, the Syrian Arab Red Crescent, ICRC and local water boards worked to develop an alternative water network by repairing or drilling more than 120 boreholes, says Michael Talhami, head of water and habitat for the ICRC in the Middle East. Maintaining these systems also poses many risks. Whenever explosive weapons are used, a certain percentage of them do not detonate on impact. Before any work on repairing urban areas can begin, the ground must first be cleared of unexploded bombs. This is costly, time-consuming yet critically important work. It adds to the many challenges of restoring life to normal after urban warfare. The destruction caused by urban warfare can take a very long time to repair. City landscapes in many cases have taken decades or even centuries to build. During intense fighting, these accomplishments, along with important local institutions and landmarks, can be destroyed in a matter of seconds, leaving scars that will take billions of dollars in investment and decades of work to heal. The increasing frequency of urban conflict has also led humanitarian organizations to rethink and improve the way they help cities prepare for intensive violence. In Iraq and Ukraine, one of the steps taken by the ICRC’s weapons contamination unit, for example, is to identify industrial sites and other places where toxic chemicals or other dangerous materials may be stored. This information could be critical when preparing for possibility of mass casualties if toxic chemicals are released in densely populated urban areas. This concern was highlighted recently by the use of a toxic chemical agent during fighting around Mosul, where 15 people — including children — were admitted to hospital showing clinical symptoms consistent with an exposure to a blistering chemical agent. In light of these cases, and subsequent allegations of uses, ICRC teams remind all parties to the conflict that there is an absolute prohibition against the use of chemical and biological weapons and their obligations to comply with international law. At the same time, the ICRC has worked to build the capacity of two health facilities near Mosul with training and protective equipment to help them safely treat patients who have been contaminated. If used in cities, such weapons could result in a tremendous loss of life and would likely overwhelm local health systems. Toxic chemical agents or biological pathogens are not only potentially harmful or lethal to the person directly affected, they could also contaminate health workers, ambulances, operating rooms, even entire hospitals, rendering these critical facilities entirely useless just when they are needed most. “Once hospital workers suspect that a chemical agent has been used, they now have the training and equipment to know how to protect themselves and how to deal with it before the person is admitted to the hospital,” says Johnny Nehme, head of ICRC’s Chemical Biological Radiological and Nuclear response team. Ultimately, cities are far more than just buildings, streets, water systems and hospitals. And the wounds people suffer are not just physical. Warfare in urban areas often means the break-up of communities and the fracturing of social networks. The intense, relentless trauma of urban conflict — ongoing fear, extreme violence and sense of helplessness — can cause deep psychological wounds. Yet there is a profound lack of psychological services for people still trapped by fighting, as well as for those in camps and in cities in neighbouring countries. For this reason, the humanitarian response is also aimed at people’s mental well-being. 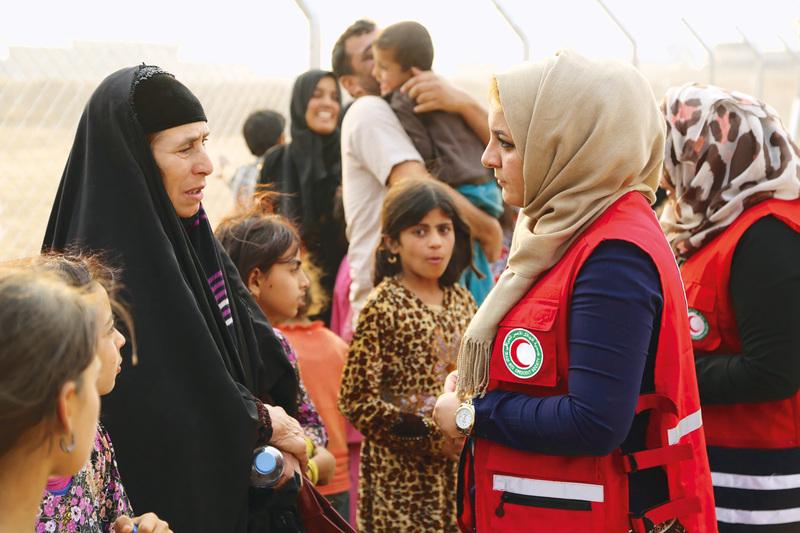 In the Khazer camp for displaced people, east of Mosul, a group of Iraqi Red Crescent Society psychosocial volunteers from the nearby Dohuk branch try to bridge that gap. They put extra emphasis on helping children, who make up almost half the camp population and have not been to school for two years. “These people have been through dreadful experiences; they need as much support as we can give,” says 29-year-old volunteer Mahdia.